Maybe you've read my previous adventures in geo-tagging photos. Previously I've focussed on how to geo-tag the photo using the Android's built in camera. But what if you want to geo-tag your photos taken with a regular camera ie one that doesn't have GPS? First you need a GPS data logger. These capture the GPS location at regular, typically 1 minute, intervals. Then you take the data, and import it into an application, along with your photos. And then apply the GPS data to your photos. You can use your Android as your data logger. In Market look for an application called 'Active GPS Lite'. Run this, (don't forget to press Menu - Tracking - Start !) and do your activity. Then at the end go to Menu - Tracking - Stop, and export the track. This exports the track as a GPSX file. These are just text files with a standard structure XML type structure. Transfer the GPSX file to your Mac, eg by USB. 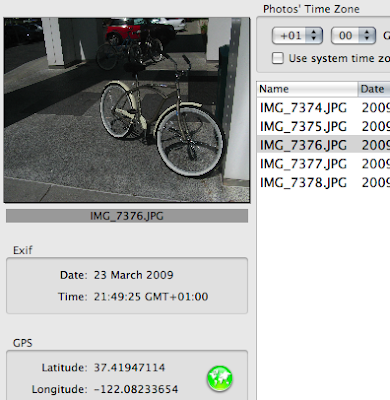 Then you need a way to automatically apply the location data to your photos. There are two applications to do this: HoudahGeo $25 and GPSPhotoLinker which is free. Both are fairly easy to use. To use GPSPhotoLinker, start the application, and select Tracks>Load Tracks from File. Load the GPSX file you copied over previously. The load your photos by going Photos>Load Photos. 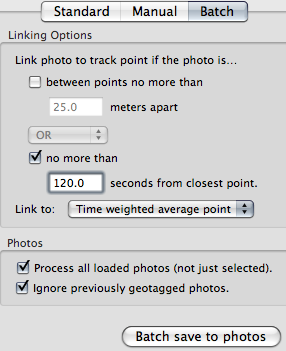 You can then import the photo into iPhoto, upload into Picasa and have the location show automatically. Are you sure about the apps name 'Active GPS Lite'? I can't find it in Market - or anywhere on Google for that matter. Yes, however, the author removed it, and now has only the pay-for application. However, Google's own My Tracks does the job just as well www.hutsby.net/2009/04/geo-tag-photos-with-osx.html. How about this Android app, that allows to connect to Facebook.